It’s that time of year where I like to write about monster toys. Well, for me that is any time of year, but it is most important to make this a tradition in October so here it goes! Today I wanted to spend some time with Monster Jigglers. I chose the topic for several reasons. Firstly, I collect Monster Jigglers. Secondly, I remember my mom giving some Monster Jigglers out as party favors at a little Halloween party we had when I was a kid. It just seemed like a very appropriate thing to write about. Hopefully by the time I am done, you will be as fascinated by these silly little pieces of rubber as I am. So if you haven’t been clued in to the world of jigglers yet, let me bring you up to speed. Jigglers are toys made out of a springy and flexible rubber that literally jiggles when you move it. If you were a kid between the 60’s- the 80’s, you probably had at least one. Though they came into popularity in the 1960’s, you can still find toys made like this today. In fact, you can still find some of the same jiggler designs of 40+ years ago in stores if you look hard enough, but I will address that later. Russ Berrie is famous for making larger gift ware jigglers that were sold in novelty shops and gift shops in the 60’s and 70’s. Most of their jigglers are animal characters with plastic inset eyes. They are made out of an oily rubber that will stain anything it touches if you leave it long enough, but they still have a following today regardless. Ben Cooper also made some cool jigglers including Marvel and DC super heroes and Universal Monsters. Yes, this is the Ben Cooper that made cheap Halloween costumes, but they also did dime store toys in the form of rubber jigglers. The rubber used by Ben cooper is more like the rubber on the toys I am talking about today (less oily). With the success of jigglers in the 1960’s, cheap-toy companies decided to jump on the band wagon and create small jigglers that could fit into a capsule in a gumball machine. You could fold the flexible rubber into a capsule and it would spring back good as new when the toy was removed. Many of them are in the form of bizarre monsters, and those are the jigglers I am discussing today. Flat Monster Jigglers just like the ones I had as a kid! Now I should make it clear that these jigglers weren’t only sold in gumball machines. Some were also sold bagged and carded, and you could probably buy them individually in your local dime store. I remember the ones that my mom gave out at Halloween came in a big bag filled with a couple dozen of them. They were cheap to produce and kids loved them. The ones above are like the ones I had as a kid. They are what I would call flat jigglers, and they were still producing them up through at least the 1980’s when I had them. Finger Puppet Jigglers. That sad red fella on the far right is totally a new Jiggler. One of the most incredible aspects of these small jigglers is that some of these designs, or bootlegs of these designs, are still being produced today. They are often sold as party favors for kids birthday parties. That means that some of these toys have had a consistent run of production for at least 40 years. In many ways that puts them in a league with Barbie, Hotwheels, and G.I. Joe when it comes to longevity, but because they are small and innocuous we never see them that way. The finger puppet jigglers are still made today. Though the designs have changed a bit over time, the concept remains the same. It can sometimes be very difficult to tell an older jiggler from a new one, but there are a few tricks to help you decipher age. One of the easiest ways to tell age is to look at the markings. This trick I am about to mention will help you date a lot of toys besides jigglers. If the jiggler is marked “Hong Kong” it was made 1985 or prior. If it is marked “China” it is made after 1985. Another way to tell is the rubber. This is hard for me to describe in a blog post, but there is a different feel to the older rubber. When you have a China jiggler and a Hong Kong jiggler to compare you will see what I mean. They feel different. Finally, not every design has been produced over and over for years. In general, the octopus jigglers or spider jigglers aren’t being produced today and probably haven’t been for decades. The frog looking ones are the same. The main two still being produced are the finger puppets and the flat jigglers. Octopus/ Spider Monster Jigglers. These are some of my favorites. Look at those crazy designs! 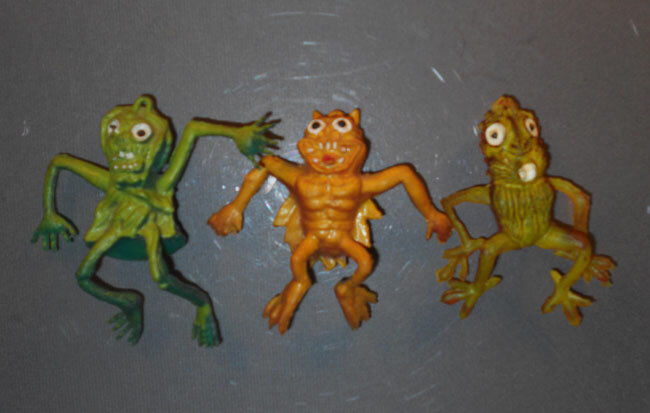 Frog Monster Jigglers. Two eyes would just be too normal. It’s either one or five with these guys. The frogs are also some of my favorites. I mean, just look at them. One of my favorite aspects of jigglers is you can see their progression through time as different companies rip each others designs and make slight alterations. They shrink and grow, and they gain limbs and they lose limbs. They come in different rubbers and plastics, and they change color as they go. As I find jigglers digging through bins at flea markets I watch them evolve over time, and I feel like a biologist finding a new species when I find a slight variation on a design. Flea markets are the Galapagos Islands of jigglers! It makes them particularly fun to collect. I never find the exact same jiggler twice. The same jiggler can take on many forms. Clearly these are the same design, but the one on the right has a horn. Based on the rubber, the one on the right is also probably the older one. These two have very similar faces, but different legs. Another one of my favorite aspects of these toys is their evolution over the decades they were created. These two may be the closest yet, but if you look carefully you will see that they are two totally different sculpts. One is most likely a shameless rip off of the other. They weren’t even trying to make it something different! That tiny guy on the left was probably created in the 80’s and is clearly based on the guy on the right. That being said, they made a lot of changes in the leg department. What a crazy evolution! I also want to take time to point out how weird and awesome some of these designs are. They are brilliant! As an artist, I love every one of them as these incredible and interesting sci-fi monsters. 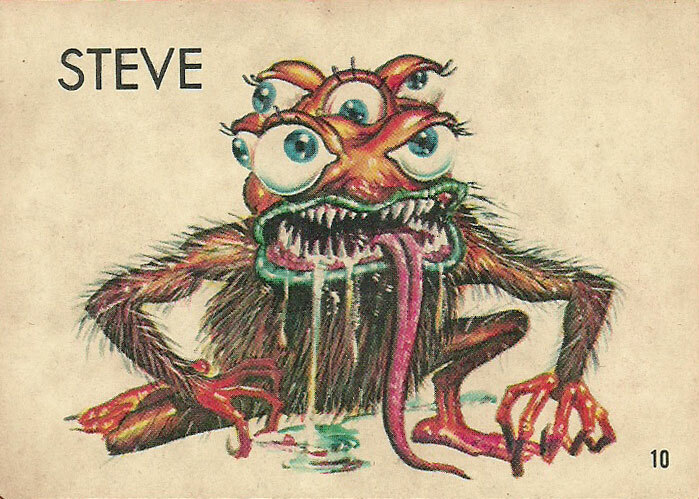 This is because many of these designs are based on work by well known artists such as Wally Wood and Basil Wolverton that were done for a line of Topps trading cards (the jigglers are clearly bootlegs). Others are based on other toy line such as The Outer Space Men by Colorforms, and some designs were done in house at the cheap toy companies based on these designs. Of course, as bootlegs of work by popular artists, these toys have garnered quite a following. 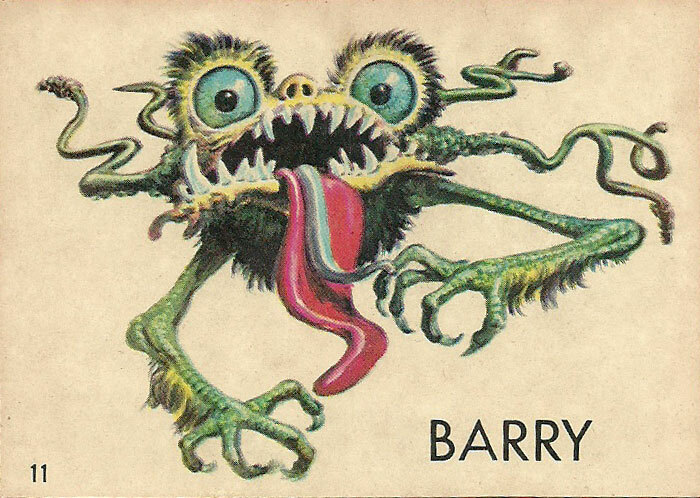 Does Barry look familiar to you? His doppelganger is in the top left corner of the photo of the spider/ octopus jigglers. My fried Ed is in the top row second from the right. You can probably thank Wally Wood for these nightmares. Remember those multi-eyed frog jigglers? You can call them Steve! 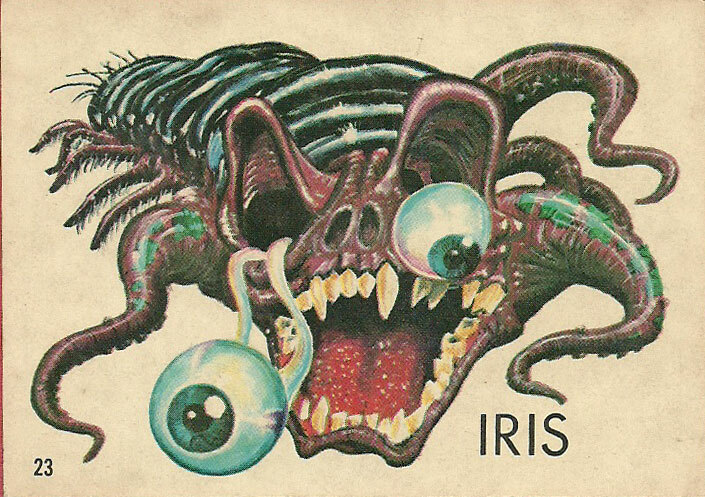 Finally Iris shares a striking resemblance to the rat bug jiggler in the next photo down. This is the least obvious of the bootlegs, but the idea is still present. These Jigglers are more figural. Two monkeys, a bootleg of a larger jiggler line called De Horribles, and a rat bug. I like the rat bug (but really, I just like them all). Thanks to having a bag of flat jigglers as a kid from a Halloween party, I became hooked on monster jigglers. 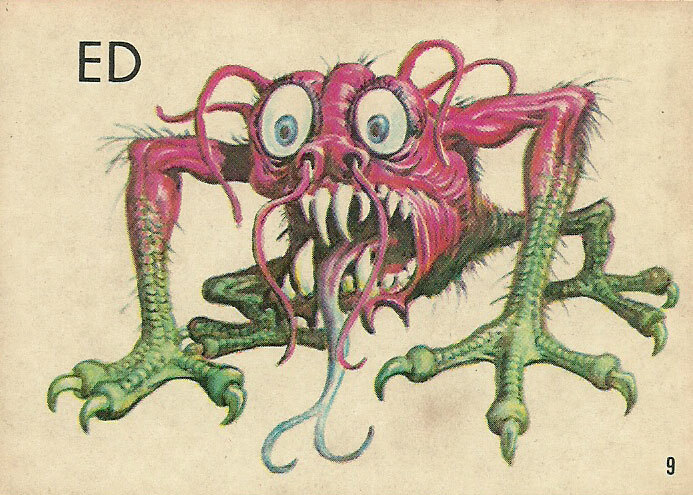 Their wacky and wonderfully disturbing designs intrigue me and keep me searching the depths of dirty boxes at flea markets to rescue them from obscurity. It is a worthwhile pursuit as far as I am concerned. Some teeny tiny jigglers. I put a big one in the back for comparison. These guys are less than half the size of their counterparts, and therefore are even harder to find! They are less than an inch long! Finally, some really cool jigglers that probably weren’t in gumball machines. These are probably from a dime store based on their size. Still, these are really great and were well worth sharing! This entry was posted in 1960's, 1970's, 1980's, 1990's, Amy, Art, Halloween, Humor, Monsters, Toys, Weird. Bookmark the permalink. 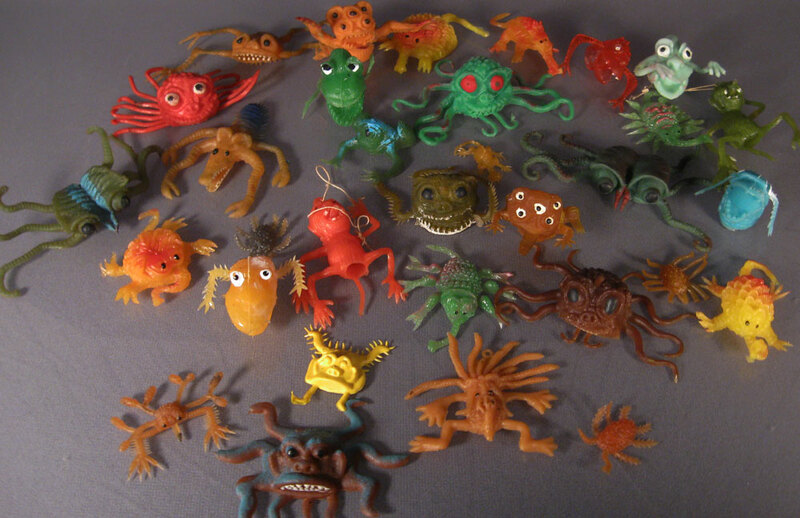 Looks like most of your monster jigglers are from the early-mid ’70s and later. Some of the earliest Rubber Uglies that hit in 1967 or 1968 have more color detail than these later ones that you have pictured. That Alvin you have is nice example; however, this one that I have here I scored early on and he has 4 color markings: red on the pincers, black eyes, orange on the shell and powder blue on the tentacles plus a more prickly underside. Same for this Kenneth: black eyes, red nostrils, white teeth and yellow on tentacles plus pronounced circular dot patterns on his underside. Email me if you would like a picture of my stash; sadly, others from this early period did not survive my childhood roughhousing! I have a gorgeous Assortment of these in three headers which are presently listed on eBay. These include many of those sci fi monsters you are talking about. Search jigglers 5c header and you will see them. Fun article!!!thanks! !